Several friends of mine have recently expressed disappointment in social media, particularly Facebook. One of them has been telling me for six weeks that he’s had enough and he’s getting out. I sense, though, that like a lot of people whose worlds are complex, he doesn’t want the trouble of learning to reinvent his web presence, and might not even exactly know how. A better way to share. I use WordPress to administer my entire web site, richardbarron.net, which you are reading right now. WordPress uses themes and plug-ins, and is more capable of letting you master your web presence than Facebook is by a factor of about a jillion. A WordPress.com account is free, just like Facebook, but is open-source and owned by the WordPress Foundation, so, unlike commercial social media, it’s not constantly selling your information or trying to sell you something. You won’t be missed. When you leave Facebook, few people will notice. As I have analogized before, Facebook is like a party with 200 guests, most of whom you don’t really know or like. When you say goodnight, they are all so busy talking to each other (about themselves), they won’t even hear you. Ease into it. You can keep you Facebook account and friends while you plan your escape. If you are like me and use WordPress, you can begin by posting simple blog entires, photos, videos, memes, or whatever other content you might have posted to Facebook, but to your WordPress site, and share links to those items on Facebook. It’s so easy that you can even have WordPress do it for you automatically. 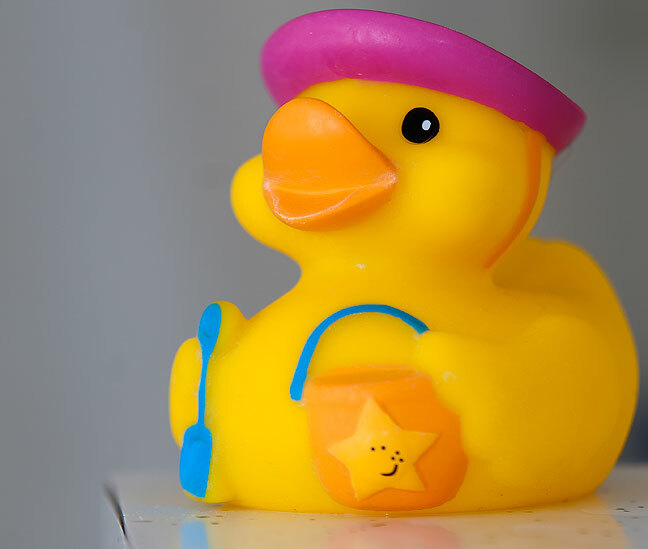 I would love to say this is the “Leaving Facebook Duck,” but the truth is that it’s on my bathroom counter to remind me to put salt in the water softener. Liberation is within reach. Once you finally, actually get out of Facebook, you might discover a feeling of liberation and relief at not having the Facebook monkey on your back any more. Instead of checking Facebook every three minutes to see if anyone commented on your status, sent you a message, or uploaded yet another embarrassingly simplistic meme, you’ll have time to actually compose and record your thoughts and ideas, and share them in a more meaningful way. Stand out. Facebook’s popularity is directly related to its mediocrity. No matter how hard you try, your Facebook page will look just about the same as everyone else’s. That’s fine for the masses who have few genuinely interesting things to say, and have no style with which to say it. But you and I are different. WordPress themes allow your site to look about as different from a Facebook page as you could imagine. “The Next Big Thing.” There’s an ad campaign for one of the smart phones that sells its new models by incrementally adding features. Tomorrow the ads might say, “Now with palm clamminess recognition. The TalkPhone 9000 version 2.9. The next big thing is here.” And we all know, of course, that “the next big thing” is stupid, self-referencial, and unnecessary. Maybe we can be the next real thing by expressing ourselves on the internet with honesty and depth. Open a new browser window and type wordpress.com. Or if you are a big phone or tablet user, download the wordpress.com mobile application (commonly call an “app”), and start playing around. Pretty soon you will have constructed something in which you can have a sense of intellectual pride instead of something you do because it is expected of you. I left Facebook almost two years ago, and have never regretted the decision. I heard “liberation and release” and “Don’t Dream Its Over” starts playing in my head. Thanks for that. When we create our own site, the issue of ownership is mute. Create your own and own it alone. I have one cousin who regularly hounds me about not being on Facebook. Sigh. It doesn’t seem to matter that I’ve explained numerous times (1) that I was on Facebook for two years or more, (2) why I left, and (3) that I have an entire page on my website explaining why I’m not on Facebook now. However, she IS the one cousin who actually visits, reads, and comments on my blog. I have honestly considered rejoining purely to leave the “placeholder” that you mentioned, with links to my blogs, but am so far not convinced that it would make any difference. I joined Facebook ages ago. I think I would be embarrassed to know just how long it has been. It has served a purpose and now it seems it has outlived that purpose. Leaving Facebook is something I have been considering. Perhaps now is just the time to do it.